Rtd Gen Chiwenga and Mohadi were sworn in today as the Republic of Zimbabwe vice presidents at State House, in Harare today. 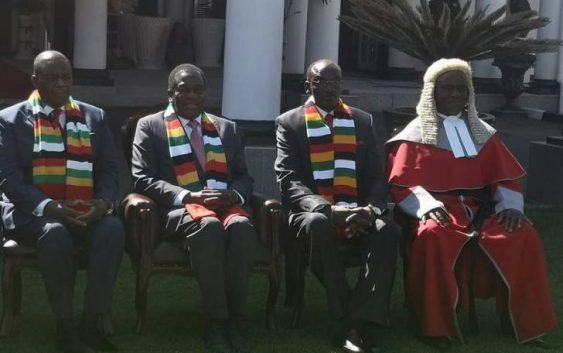 Chief Justice Luke Malaba presided over the ceremony which was attended by Zimbabwe’s President Emmerson Mnangagwa. As dictated by the constitution, the two Vice Presidents pledged to uphold the Republic of Zimbabwe constitution and conduct their duties to the best of their abilities. They were both accompanied by their spouses and later held a photo session with President Mnangagwa, CJ Malaba and family members. The swearing of the two VPs follows the inauguration of Emmerson Mnangagwa was sworn in on Sunday as the President at the National Sports Stadium, while his two vice presidents were sworn in this morning, but Zimbabwe remains in limbo as we have no cabinet ministers yet. The former ministers cannot legally carry out any ministerial duties according to our constitution. So far the Republic of Zimbabwe, in in auto pilot, running without a government since Mnangagwa’s inauguration four days ago,The president will attend the Beijing Summit the forum on China-Africa Cooperation (FOCAC). So far the Republic of Zimbabwe, in in auto pilot, running without a government since Mnangagwa’s inauguration four days ago, because former ministers can only perform g ceremonial duties, while Permanent secretaries are now running government business, so, just like lone ranger Mugabe, Mnangagwa is operating is single handedly running government. Zimbabwe’s Constitution, dictates that, a ministerial tenure or that of a deputy minister automatically becomes vacant when a new president takes office. ZIMBABWE’S PRESIDENT EMMERSON MNANGAGWA appoints 7-member of foreigners and local commission of post election violence which led to six people shot dead by the military 1 August 2018.